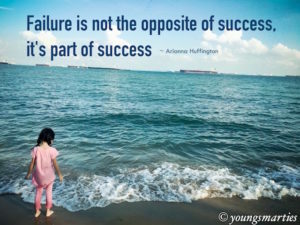 So how do we teach our children about failures? Here are some quick tips:? 1. Not everyone is a winner? As a parent, we want to protect your child as much as possible especially when it comes to failure. It’s very heartbreaking to watch your child’s hopes and dreams being dashed. In our society, we all have been conditioned that we need to come out on top otherwise you are a person who will not succeed. Avoiding failure and disappointment is not the success formula. It is essential that your child learns how to encounter failure and overcome it with dignity and a fuller understanding of what went wrong and how to get it better. Young Smarties has been doing home practice since her little ones were young (although they are not old now). They love to share what they learn with everyone else out there. Research on what to teach, how to teach and its preparation can be a challenge. Bet, it will even be more challenging if you are a working/busy parent! So fret not, you can always refer to the Young Smarties blog for ideas on home learning as they are always exploring new ways to learn. Home practice can be done in a fun and relaxing manner. It helps to enhance and build strong and nurturing relationships between the parent and child too. To find out more about Young Smarties – click here.